Glenn Edward "Bo" Schembechler, Jr. (April 1, 1929 – November 17, 2006) was an American football player, coach, and athletics administrator. He served as the head football coach at Miami University from 1963 to 1968 and at the University of Michigan from 1969 to 1989, compiling a career record of 234–65–8. Only Joe Paterno and Tom Osborne have recorded 200 victories in fewer games as a coach in major college football. In his 21 seasons as the head coach of the Michigan Wolverines, Schembechler's teams amassed a record of 194–48–5 and won or shared 13 Big Ten Conference titles. Though his Michigan teams never won a national championship, in all but one season they finished ranked, and 16 times they placed in the final top ten of both major polls. Schembechler played college football as a tackle at Miami University, where in 1949 and 1950 he was coached by Woody Hayes, for whom he served as an assistant coach at Ohio State University in 1952 and from 1958 to 1962. In his first ten years at Michigan, Schembechler's teams squared off in a fierce rivalry against Hayes's Buckeyes squads. During that stretch in the Michigan–Ohio State football rivalry, dubbed the "Ten-Year War," Hayes and Schembechler's teams won or shared the Big Ten Conference crown every season and usually each placed in the national rankings. In 1988, Schembechler assumed the role of athletic director at Michigan, succeeding Don Canham, the man who hired him as football coach in 1969. Schembechler retired as head football coach after the 1989 season. His longtime assistants, Gary Moeller and Lloyd Carr, helmed the team for the next 18 years. Schembechler left the University of Michigan in 1990 to take a job as president of Major League Baseball's Detroit Tigers, which he held until 1992. He was inducted into the College Football Hall of Fame as a coach in 1993. During his later years, Schembechler remained in Southeast Michigan and hosted a sports radio show. He died in 2006 at the age of 77 on the eve of that year's Michigan–Ohio State football game, a historic No. 1 versus No. 2 showdown. Schembechler was born and raised in Barberton, Ohio, a suburb of Akron. His nickname "Bo" came from his sister's attempts to say "brother" when they were young children. Schembechler's father was a firefighter. One of Schembechler's seminal experiences was seeing his father refuse to accept a stolen copy of a civil-service exam—despite the fact that the other applicant was reported to have received a stolen copy himself. Schembechler's father took the exam without having received the answers, missed one more question than the other applicant, and did not receive the promotion he coveted. Schembechler often told the story, saying the experience taught him more about integrity than any lecture ever could have. Hard work and integrity were two themes of Schembechler's career. Schembechler attended Miami University in Oxford, Ohio. He played football under two legendary, and completely different, coaches. Sid Gillman, his first coach at Miami, was an innovative offensive mind and one of the fathers of the modern passing game. His concepts helped to form the foundation for football's West Coast offense. Prior to Schembechler's last season, Gillman departed to become head coach at the University of Cincinnati. He was replaced by the renowned and fiery Woody Hayes, who could not have been more unlike Gillman. Hayes embraced the run, eschewed the pass, and demanded tough, physical play from his linemen. Rather than innovation, Hayes stressed repetition—he wanted his players to run each play flawlessly. Over the next forty years, Hayes' impact on his young protege was clearly evident. Schembechler graduated from Miami in 1951 and earned his master's degree at Ohio State University in 1952 while working as a graduate assistant coach under Hayes, who had become OSU's head coach. After a tour of duty in the U.S. Army, Schembechler served as an assistant at Presbyterian College in 1954, followed by a year as freshman coach at Bowling Green. 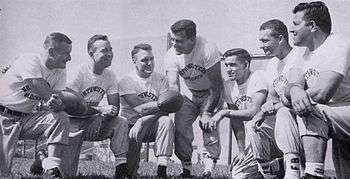 When Schembechler's former college teammate Ara Parseghian, Hayes' successor at Miami University, was hired as head coach at Northwestern in 1956, Schembechler joined him and spent the next two seasons there as a defensive assistant. In 1958, Hayes hired Schembechler to serve again on his staff at Ohio State. Schembechler spent five more years at Ohio State and became one of Hayes' most trusted assistants. During that time the two cemented their lifelong friendship. Schembechler was fond of recounting the number of times that Hayes "fired" him, only to send a graduate assistant to fetch him after tempers had calmed. Schembechler, Hayes, Parseghian, and several of their "Cradle of Coaches" compatriots are the subject of the book Fields of Honor, written by coach John Pont's niece, Sally Pont. In 1963, Schembechler returned to Miami University to become head coach of his alma mater. Over the next six seasons, Schembechler led the Redskins to a 40–17–3 record, winning a pair of Mid-American Conference titles and finishing second three times. The team's top season was 1966, as Miami went 9–1 overall. Miami's offense was led during those seasons by quarterbacks Ernie Kellerman and Bruce Matte. 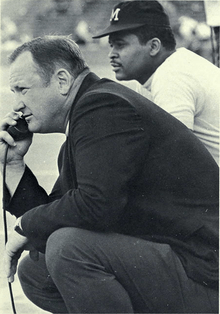 Schembechler became Michigan's 15th head coach after the 1968 season, succeeding Bump Elliott. He was hired in 15 minutes. It took athletic director Don Canham that long "to sense the intensity, the enthusiasm of a man destined to be a winner." Besides a stellar record at Miami he also "brought a unique five-man angle defense and a guarantee that he would make it work within five years." At Michigan, Schembechler became one of college football's greatest coaches. He won a school-record 194 games, lost only 48, and tied five for a winning percentage of .796. His teams never posted a losing season. In Big Ten Conference play, he had a record of 143–24–3 for a winning percentage of .850. His Michigan teams won or shared 13 Big Ten titles and made 10 Rose Bowl appearances. His 96–16–3 record during the 1970s was the best of any Division I coach. Schembechler led the Wolverines to a total of 17 bowl games, going 5–12 in 21 years, placing him ninth in all-time bowl appearances. He was voted national coach of the year in 1969 by both the American Football Coaches Association and the Football Writers Association of America. Schembechler's greatest victory came in his first season, when he led the Wolverines to an upset victory over a standout Ohio State team coached by his old mentor, Woody Hayes. Hayes' Buckeyes dominated the series during the late 1950s and for most of the 1960s as Michigan fielded a number of uncharacteristically mediocre teams. In 1968, the year before Schembechler became head coach, Hayes made it clear how far Michigan had fallen behind its traditional rival, when the Wolverines lost 50–14. At the end of the game, Hayes decided to pursue a two-point conversion rather than a simple kick for an extra point. Legend has it that when Hayes was asked why he "went for two," he responded, "because they wouldn't let me go for three." The embarrassment of that outcome set the stage for the 1969 rematch. In 1969, the Buckeyes entered the game as defending national champions and 17-point favorites with the top ranking in the country and a 22-game winning streak. Hayes' 1969 squad included five first-team All-Americans. But Schembechler's 7–2 Wolverines dominated a team Hayes later considered his best, beating Ohio State 24–12. In a single afternoon, Schembechler and his charges resurrected Michigan's football tradition and returned the program among college football's elite. Both Schembechler and Hayes, who remained personal friends until Hayes' death in 1987, agreed it was Hayes' best team and Schembechler's biggest victory. Michigan's win over Ohio State in 1969 is considered to be one of the greatest upsets in college football history and the most significant win for a Michigan team ever. The Wolverines and Buckeyes proceeded to engage in a fierce "Ten Year War" that elevated an already storied Michigan–Ohio State football rivalry into one of college football's greatest annual grudge matches. For ten years the two dominated the Big 10, splitting ten conference titles between them and finishing second eight times. They were so dominant that the Big Ten earned a nickname of "Big Two, Little Eight" during that era. After a decade of memorable on-field stratagems, sideline antics, and locker room psychological ploys, Schembechler held a 5–4–1 advantage. Schembechler's tenure at Michigan was also notable for the renewal of Michigan's rivalry with Notre Dame. Despite the fact that the two schools are located within 200 miles of one another and ranked first/second in both total wins and winning percentage in college football, they had not played each other since the 1940s. The resurrection of the rivalry was facilitated by Schembechler's close friendship with Ara Parseghian, Notre Dame's coach at the time of Bo's arrival. Schembechler, however, never had a chance to coach against his former mentor, as scheduling commitments prevented the series from resuming until 1978, after Parseghian had left Notre Dame and was succeeded by Dan Devine. Despite Schembechler's success during the regular season, he was less successful in bowl games. His overall record was 5–12, which includes a 2–8 record in the Rose Bowl. The Wolverines lost the 1970 Rose Bowl, their first bowl game under Schembechler, while he was hospitalized after suffering a heart attack on the previous day. Michigan went on to lose their next six bowl games before winning five of the last ten they played under Schembechler. The only four of his 21 Michigan teams that did not play in a bowl, however, were a shade short of perfection, losing a total of three games while compiling a combined record of 39-3-1. One loss was by three points and a second was lost in the last seconds when a 33-yard FG attempt was ruled to be just wide of the goalposts. Following the 1980 season, Schembechler gained the first of his two Rose Bowl victories by beating the Washington Huskies. The 1980 Michigan team featured the talents of Anthony Carter, a three-time consensus All-American. In 1980 Michigan stumbled early in the season, losing two of its first three games. As a result of the two losses, Michigan was eliminated from consideration for college football's national championship, finishing 4th in the end-of-season polls. But Schembechler maintained that his first Rose Bowl champions were the country's best team by season's end. They did not allow a touchdown over the course of their last five games, giving up nine points total. Perhaps spurred by Carter's success, Schembechler's teams began to pass more during the 1980s, but Schembechler never completely shed his image as a run-first offensive coach. At the same time, his teams continued to enjoy consistent success throughout the decade. Jim Harbaugh, a future NFL All-Pro quarterback and current head coach of the University of Michigan, led Schembechler's 1985 team to a 10–1–1 record, a 27–23 win over Nebraska in the Fiesta Bowl, and a No. 2 ranking in the final polls, the highest finish ever for one of Schembechler's teams. Schembechler's last two teams went to the Rose Bowl, splitting two games with USC. Schembechler retired from coaching after the Rose Bowl in 1990. He decided to retire at the relatively young age of 60 because of his history of heart problems and was succeeded by Michigan's offensive coordinator Gary Moeller, whom he handpicked. Schembechler was also the athletic director at Michigan from 1988 until early 1990. Just before the 1989 NCAA Basketball Tournament, men's basketball head coach Bill Frieder announced that he was taking the head coach position at Arizona State University, effective at the end of the season. Insisting on those in the program being dedicated to the school, Schembechler immediately fired Frieder and appointed assistant basketball coach Steve Fisher as interim head coach, while famously announcing that "a Michigan man is going to coach a Michigan team" in the NCAA tournament. The literal meaning of the Schembechler's quote was that only a current, 100 percent-committed university employee would coach the team, not Frieder, whose loyalties had just switched to Arizona State. Ironically, Frieder was an alumnus of Michigan, while Fisher was not. Fisher led Michigan to six straight victories in the tournament and the 1989 national championship. Schembechler witnessed the championship game, an 80-79 overtime cliffhanger vs. Seton Hall, two days after his 60th birthday (the semifinal victory over Big Ten rival Illinois was played on Schembechler's birthday). Steve Fisher graciously submitted Bill Frieder's name to receive the championship ring, however someone, likely from Schembechler's administration, removed his name. Hypocritically, Schembechler would coach Michigan’s Rose Bowl team in 1990 while having secretly accepted the role of President for the Detroit Tigers, publicly announcing the hire after the game. Schembechler began his tenure as head coach at Michigan with a rallying cry to his players: "Those who stay will be champions!" This slogan foreshadowed the challenges Michigan football players would endure from the dramatic culture change initiated by Schembechler, who emphasized toughness and introduced practices and conditioning far more rigorous than any of the players had been exposed to before. His first training camp in 1969 saw around 140 players enter but a mere 75 emerging from the grueling camp and choosing to embrace Schembechler's system. Schembechler's subsequent successes and legacy of propelling the Michigan football program to further national prominence immortalized his promise to his players after accepting the head coaching position at Michigan. Every Michigan football player who played for Bo Schembechler and stayed at Michigan for four years left Michigan with at least one Big Ten championship ring. Furthermore, not once did any Michigan player under Bo endure a losing season during his tenure. As such, "Those Who Stay Will Be Champions" remains a beloved team slogan for the Michigan Wolverines and has been immortalized into the tradition and mythology of Michigan football. On January 15, 1982, Texas A&M offered Schembechler nearly $3 million for 10 years—the richest contract in the history of college athletics at that time—to become the school's football coach and athletic director. Schembechler turned it down. "Frankly, I've come to the conclusion that there are things more important in this world than money," Schembechler said. "For that reason, I've decided to stay at Michigan." From 1990 to 1992, Schembechler was president of the Detroit Tigers of Major League Baseball. In 1991, he presided over the firing of Tigers' longtime broadcaster Ernie Harwell. The move was decried by fans and the press. Management at the Tigers' flagship radio station WJR later claimed responsibility for the sacking, but Schembechler and club owner Tom Monaghan were denounced for the decision. Schembechler was an opponent of female sports reporters in the men's locker room, defending Tigers pitcher Jack Morris, who told a female Detroit Free Press reporter in 1990, "I don’t talk to women when I’m naked unless they’re on top of me or I’m on top of them." Schembechler stated "no female member of my family would be inside a men's locker room regardless of their job description" and suggested "the whole thing was a scam orchestrated by you people to create a story." Schembechler was fired by the Tigers in 1992, via fax. Schembechler maintained an office at the University of Michigan's football facility, which is named Schembechler Hall. Schembechler's former assistants, Gary Moeller (1990–94) and Lloyd Carr (1995–2007), followed him as head coach. Schembechler was also active in numerous private charities. Schembechler also hosted a pre-game show on the Detroit ABC affiliate, WXYZ-TV along with Sports Anchor Don Shane named "Big Ten Ticket". It was devoted to his analysis of the Wolverines, the Michigan State Spartans and other Big Ten Conference teams. On April 30, 2005, at Michigan's annual spring commencement, Schembechler was awarded an honorary doctor of laws degree. Schembechler had a long history of heart trouble. On December 31, 1969, the eve of his first Rose Bowl appearance, he suffered a heart attack, and had another in 1987 while he happened to be at University of Michigan Medical Center for tests. He had two quadruple heart bypass operations, the first in 1976 and the second following his second heart attack. During a taping of the WXYZ-TV program Big Ten Ticket in late October 2006, Schembechler collapsed and was taken to the hospital. Following the episode, he had a heart pacemaker implanted into his chest to regulate his heartbeat. As late as a week before his death, he had stated his doctors were still adjusting the device, which covered about half his chest. On Thursday, November 16, 2006, and though he was not feeling well, Schembechler attended the funeral of his close friend and 1971 quarterback, Tom Slade. That night, Bo delivered his traditional Thursday night pep talk before the Ohio State game. According to The Detroit News: "Bo's speech was not about Ohio State, the Big Ten title or a national championship. The whole speech was about Tom Slade and how, if the players worked hard, listened to their coaches and stuck together as teammates, one day they might be as good a Michigan man as Slade. That was the goal at Michigan, not national championships." Schembechler finished by exhorting them to remember "the team, the team, the team!" The next day, on November 17, 2006, Schembechler collapsed in a bathroom at WXYZ-TV just prior to the taping of Big Ten Ticket around 9:15 am. He was taken to Providence Hospital in Southfield, Michigan where he was pronounced dead at 11:43 am. At a press conference a few hours after his death, it was reported by his doctor, Dr. Kim Eagle of the University of Michigan Health System, that his death was from the terminal stage of heart disease, where the heart muscle itself does not respond to the pacemaker, a common cause of death for persons afflicted with severe heart disease. Schembechler died the day before one of the biggest games in the history of the Michigan–Ohio State football rivalry. He was not planning to attend the November 18 game in Columbus, because his doctors had advised him that attending the game might be too much stress for his heart. Instead, Bo and his wife, Cathy, had packed the car and had planned to drive to suburban Dayton, Ohio to watch the game with his former Miami teammate and best friend, Bill Gunlock. The University's Board of Regents approved a plan for the renovation and expansion of Michigan Stadium on the day of Schembechler's death. On November 21, 2006, the University of Michigan held a memorial service for Schembechler in Michigan Stadium. Approximately 20,000 fans, ex-players and coaches including former Schembechler player and assistant coach and then LSU head football coach Les Miles turned out during the middle of a work-day to pay their respects to Schembechler and to celebrate his life. Former Ohio State head coaches Earle Bruce and John Cooper attended, along with then Ohio State head coach Jim Tressel and his entire staff. Before his death, Schembechler had agreed to be an honorary pallbearer for former Michigan Wolverine and University of Michigan alumnus President Gerald Ford. Ford, himself a center at Michigan in the 1930s, died on December 26, 2006. A pew inside Washington National Cathedral was draped with a UM stadium blanket in Schembechler's memory. After Schembechler married Mildred (Millie) in 1968, he adopted her three sons: Donald (Chip), Geoffrey and Matthew. Schembechler and Millie then had a son together, Glenn III (Shemy). Matt played football at Western Michigan University and Shemy is the President of GES Advisory Company. Chip died in a car accident in 2003. Geoff is a Domino's Pizza franchisee based out of Lowell, Massachusetts. Following Millie's death in 1992, he founded the Millie Schembechler Adrenal Cancer fund at the University of Michigan which has provided the most advanced research for this rare form of cancer in the world. He married Cathy Aikens on November 27, 1993. ↑ "Schembechler collapses, dies at 77 – College Football – ESPN". Sports.espn.go.com. 2006-11-19. Retrieved 2015-02-05. ↑ Richards, Gregory B. and Larson, Melissa H.: Big-10 Football, page 95. Crescent Books, 1987. ↑ "Sunday night NFL options hardly must see TV". Nctimes.com. Retrieved 2015-02-05. ↑ "The forgotten man of Michigan's '89 title". The San Diego Union-Tribune. Retrieved 31 January 2016. ↑ "Those who stay will be champions". The Michigan Daily. 2006-11-18. Retrieved 2015-02-05. ↑ "Schembechler chronology". The Argus-Press. Associated Press. December 15, 1989. Retrieved December 3, 2011. ↑ McKenna, Dave (October 27, 2016). "The Writer Who Was Too Strong To Live". Deadspin. Retrieved November 26, 2016. ↑ Newhan, Ross (August 4, 1992). "Bo Gets Ax by Fax : Tigers' Message to Schembechler: You're Fired". LA Times. Retrieved January 3, 2012. ↑ "University of Michigan". Umich.edu. 2005-03-17. Retrieved 2015-02-05. ↑ "ESPN – Schembechler collapses, dies at 77 – College Football". Sports.espn.go.com. 2006-11-19. Retrieved 2015-02-05. ↑ Guest (2009-01-08). "Sports –". Comcast.net. Retrieved 2015-02-05. ↑ "Report: Michigan legend Schembechler hospitalized again". ESPN. November 17, 2009. Retrieved 2009-09-09. 1 2 "Video". CNN. November 27, 2006. 1 2 "UM vs OSU Woody vs Bo". Bentley.umich.edu. Retrieved 2015-02-05. ↑ "2016 BGSU Football Media Guide" (PDF). Bowling Green State University. 2016. pp. 137, 141. 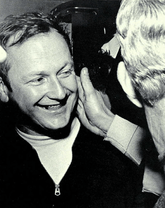 ↑ Glenn E. Schembechler – Bo Schembechler – Ohio History Central – A product of the Ohio Historical Society Archived June 29, 2011, at the Wayback Machine. 1 2 3 4 "1987 Football Team – University of Michigan Athletics". Bentley.umich.edu. 2007-03-31. Retrieved 2015-02-05. 1 2 3 "1977 Football Team – University of Michigan Athletics". Bentley.umich.edu. 2007-03-31. Retrieved 2015-02-05. ↑ Meisler, Natalie (November 22, 2010). "Buffs, Huskers going separate ways after seeing their series turn serious". Denver Post. 1 2 3 4 5 "1970 Football Team – University of Michigan Athletics". Bentley.umich.edu. 2007-03-31. Retrieved 2015-02-05. ↑ "1990 Football Team – University of Michigan Athletics". Bentley.umich.edu. 2007-03-31. Retrieved 2015-02-05.